We’d had a really great dinner but felt we needed something sweet to make it just “perfect” – know what I mean? We decided to try out Island Cream Co., in Lahaina, as we’d heard it was really good but hadn’t checked it out yet. Well, let me tell you Island Cream Co. is a winner! Lots of flavors, homemade ice cream, three flavors of waffle cones, great staff – what’s not to love? We were blown away by the awesome service and flavor choices. First of all, they let you sample as many flavors as you want… and I have a guilt complex that won’t allow me to sample more than two without feeling obligated, but they encourage it! (Ice cream is therapy after all.) They have tons of fun flavors from the classics – including vanilla, cookies and cream (LOADED with Oreos) – to novelty flavors like Almond Joy and Spicy Chocolate! One of the most surprisingly delicious flavors I sampled was the Buffalo Peanut, a chocolate ice cream with peanuts soaked in their homemade buffalo sauce. You HAVE to try a sample, it was soooo, soooo good! I went with the Turtle: chocolate ice cream with caramel, nuts which tasted like Nutella, in a vanilla waffle cone. Awesome! It definitely hit the spot. They also have sorbet and non-dairy offerings, PLUS handmade frozen yogurt. You can bet your sweet tooth I’ll be back for many moons to come. 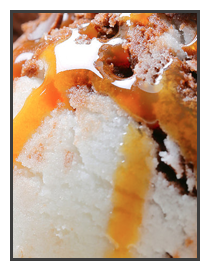 Island Cream Co. is so good, you’ll get cravings! 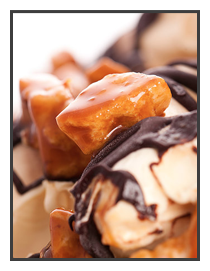 Check out their website at IslandCreamCo.com for a full list of flavors, or call 808-298-0916.